Hockey – Is It a One Season Sport? This year one dad had a vision to give our players an opportunity to play the sport they love for just a bit longer. That father was Joe Trozzo. He took it upon himself to organize 11 weeks of summer hockey. Joe offered the opportunity to any players who wished to participate. After numerous emails and word of mouth 15 players committed to the summer hockey. 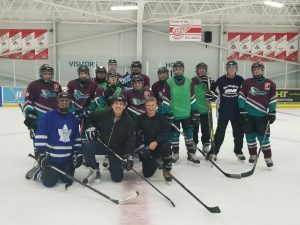 On the first day the players took to the ice and were excited to see their friends. The group was made up of players from all of our teams. It was nice to see players who don’t normally play together getting along. It really shows what kind of organization we are. We truly are The Grandravine Family. Each night the payers were divided into two teams and it was game on. Some of the players dads took to the ice too. This made for some interesting hockey as the players had something to prove by beating their dads. Being at the rink and even playing some nights, I was able to the progress in some of the players and in my opinion these players are going to be 100% hockey ready this winter season. After this season’s success, we are hoping that this summer hockey becomes an annual tradition and more players take the opportunity to play. Thank you to Joe Trozzo for organizing this.